There is nothing more exciting for an artist than getting a new piece of kit. We are obsessed with our little trinkets and the potential they could unlock in us. If only we had that exact Lamy pen, if we could just add potters pink to our palette, if we could find the right waterproof ink, then everything would be perfect and we could finally get on with being the artist we were always meant to be. It’s likely you already have a bag/box/cupboard/room full of supplies somewhere in your home. Remember how they were going to change your life too? Lay ’em all out and show ’em some love. Throw out the old dried up markers, clean off that eraser. Now sort through it and divide it into two piles. One for the things you already use all the time, and the other for the poor neglected souls. Don’t worry, I’m not gonna make you chuck them away. We’ll come back to them in a mo. For now let’s talk about that first pile. Top of the class and smug as anything, they are your “go to” kit. These will now never leave your side. The whole lot should be small enough to fit into a neat little pencil case (*excuse to buy a new pencil case*), which is going to be in your bag ALL THE TIME. 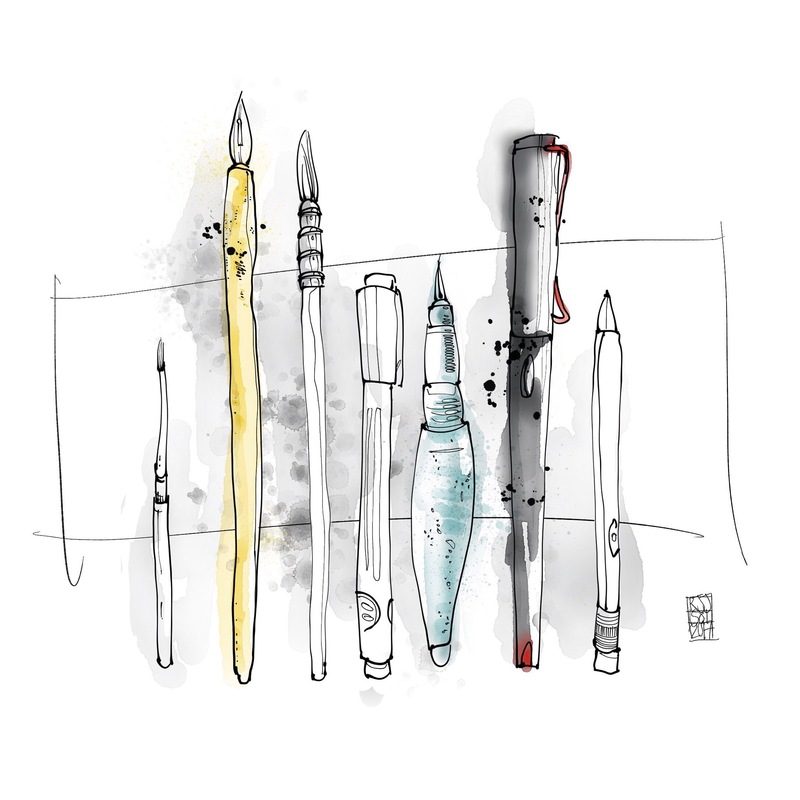 It should be the bare bones of whatever you use to make your work: a couple of pencils, pens, a travel paint set… It really doesn’t need to be more than that. But I know you’re like me and you are going to try and sneak those extra bits in, so I will allow you ONE additional extra. Pop it in, but thats now your project piece. By letting it join in, you are making it your mission to use it. It must appear in every artwork you do for the duration of its stay in the case. If it’s unopened after a couple of weeks then you are going to put it right back into that other pile. Speaking of that other pile, they’ve just been promoted to your studio kit. These are going to wait patiently at home for you to come back with all the sketches you’ve collected. Keep them out in the open, in a cleanly organised place so that you can see everything that’s on offer. You’ll never forget you have that sneaky masking fluid again. And then, when you are ready, they are going to earn their keep by helping you develop those sketches into strange, glorious new artworks unlike anything you’ve made before. Out of interest, that new thing you’ve just ordered? Which pile is it going into? Regardless, you are now ready. Armed with your “go to” travel kit, it’s time to step out into the world and start collecting ideas. Hurry, your studio kit is waiting for you.